Looking for a superior quality NWP with a little bit of out of the ordinary variation? Here's one of the best condition NWP's you'll run across. NWPRR CS-8 brass cast switch lock with the added bonus of having the ADLAKE cast dust cover instead of the usual hex logo stamped on it. This lock is just gorgeous as the pics don't do it justice. Complete original and untouched with original chain and clevis. All mechanicals strong and it functions perfectly with the NWP key that is currently for sale in the key section. What a beautiful example better than most in advanced collections today and a variation as well! 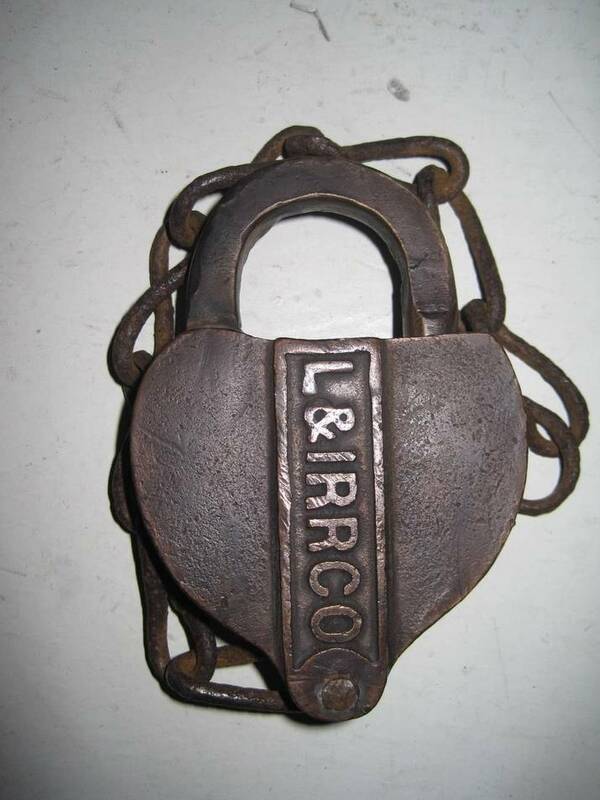 CPRR of CAL stamped on the back of this early car lock. Manufactured by the Sacramento shops of the Central Pacific in 10 of 1885, this lock also functions nicely and its only fault as most of these do, is that the dust cover spring is not functioning. Everything else about the lock is very nice. Hard to find these with original chain and clevis. Central Pacific Railroad Co. CPRR CO. stamped on the back of this Sacramento shops produced lock. Lock manufacture date 3 / 87 stamped on the back as well. This excellent example is keyed for the Freight Cars and has NO issues with spring tension, all springs including the dust cover spring are good. For those who have searched for these with good springs, you'll know what a rarity that is. Very nice lock ready to enjoy. Standard UP CS-21 cast lock in top shelf condition. Strong springs and ready to enjoy. From the Southern or SUNSET ROUTE of the Southern Pacific comes this very nice and hard to find R&B lock. Cast Sou Pac. Lines CS-25 Roadway & Bridge Department all over the back. The southern route cast locks are very much harder to find than the standard SP locks. This beautiful example functions nicely and is only missing clevis and chain. Beautiful patina and ready to display. Smallest and earliest version of the 3 SP sunset signal locks. This rather plain looking lock is the hardest in the series to find in good condition. This is a nice example. The number 40 stamped on the shackle. The lock appears to operate although its key may be a tough prospect to find as they were generally only marked with the matching number on them. Still a very nice example. Most signal locks from this road are cast CM&StP Signal, here is one of the harder to find later versions. Stamped CMStP&PRR on the front and SIG DEPT. on the back. It takes the standard signal key and works fine. Very nice lock harder to find. This full-heart version of the standard Milwaukee Road switch lock is in excellent condition and has full and strong function in all springs. Manufactured and hallmarked by Slaymaker on the shackle, this lock comes with a matching key marked CMStP&PR. Beautiful set. 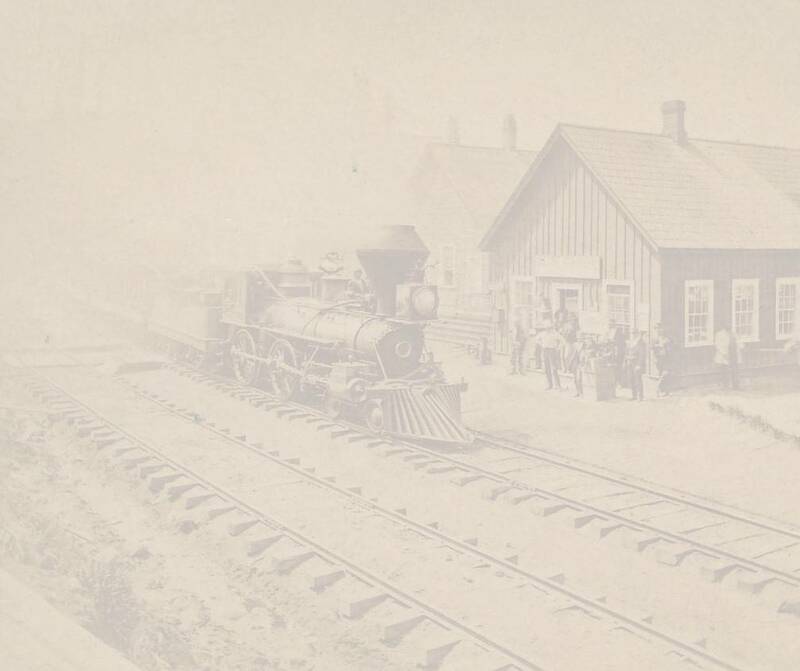 UNION PACIFIC / OREGON RAILWAY & NAVIGATION CO. Dating to approximately the turn of the Century, this OR&N switch lock carries the soon to be parent company's name on the back. Beautiful and difficult to find cast down the back panel UNION PACIFIC but stamped OR&NCo on the shackle and keyed for the OR&N's standard switch keying. Absolutely outstanding condition and function. Missing only the original chain. Rarely offered for sale, don't miss this one as it is museum quality. UNION PACIFIC in big fat serif letters on the back of this early 1880's vintage brass switch lock manufactured and hallmarked by Dayton MFG. Co. Just a great representation of this scarcely seen variety. The lock functions beautifully and is in pristine untouched condition with original chain attached. All springs strong and functional. It is truly exceptional to find one of these, let alone in this condition. CCC&StL incised in the front of this giant steel switch lock made by Moon. The dust cover spring is partially functioning only because there is some break out damage on the side of the dust cover. The lock appears to be in good working order although we do not have a key to test it. This is a hard lock to find from this manufacturer. Most of these are rusted and severely pitted. This one has an above average surface condition. Don't miss the opportunity. One of the prettiest cast locks that exists. The Overland logo lock. This version is the smallest of the three versions and is in beautiful condition with good spring tension in the shackle. 1923 Date on the back of the shackle and original chain and clevis. This one comes with a home made key that occasionally operates the lock. Doesn't appear to have been made quite right but just the right amount of temperament gets it open. B&MRR over S on the back of this brass heart shape switch lock manufactured by Williams Page & Co. of Boston. Simply a beautiful example complete and original with blind rivets which probably dates this lock to the 1870's at the latest. Strong spring in the dust cover, spring back in the shackle. No key for this lock but guaranteed to function or buyer may return it for full refund. A very nice example from this early maker. This tiny little heart shaped brass lock is just a beautiful example of the Northern Pacific's mail car lock. Super hard to find these little guys and this lock is in wonderful original condition. Stamped on the back NPRy and on the front with the Loffelholtz hallmark and also USMC for US Mail Car. This lock is in perfect working order and has original clevis, chain and even the car mounted eyelet! You will travel long distances and sort through many a shop or show to find one of these, let alone one this nice. 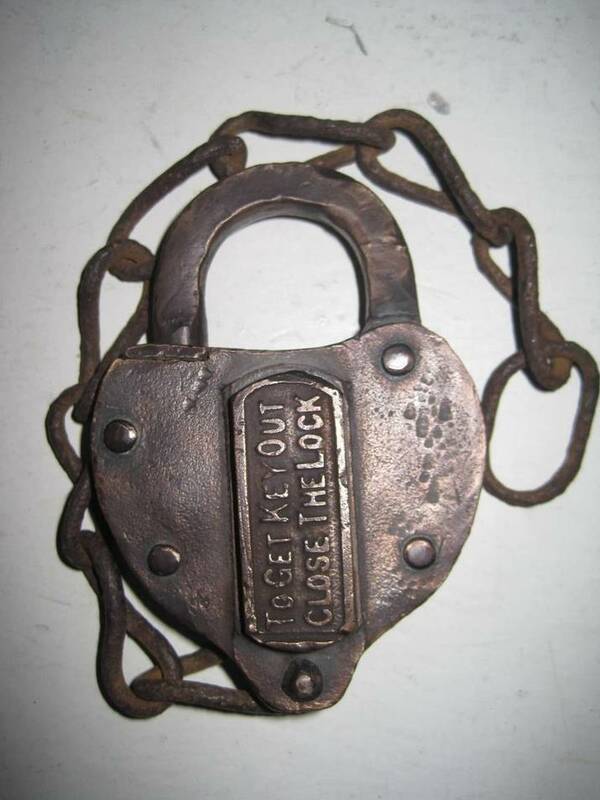 Early 1880's vintage Oregon Railway & Navigation lock. Manufactured by Post & Co marked on the dust cover, The lock is backstamped in an arc OR&NCo. Oddball early keying which is not the later 80's and 90's regular switch cut. The lock appears to have been repaired and has excellent spring tension in the shackle and dust cover. Original clevis and chain finish of this early and awesome example of early Pacific Northwest rail and steam navigation on the Columbia River. Northern Pacific cast early version stair step heart shape brass switch lock. This is the way we like to find them! Rich dark brown patina covers this lock and before you start thinking the paint is a eyesore, that paint is original NP! It is the lighter brown shade found on the upper portions of wayside buildings and depots. The lock comes with strong mechanical springs, clevis, chain and S hook. What a beautiful survivor with some added historical color! Small heart shape lock marked CB&QRR on the hasp. This small signal lock still has some silver paint on it from its in-service days. Nice lock, all mechanicals appear working with good spring tension in hasp and dust cover. L&IRR brass locks show up from time to time, but this is the first cast raised letter L&IRRCo lock we've seen. This lock is very much the same design as the L&NRR cast locks however, it has a square shackle! All springs are strong and the hasp has good tension in it. We don't have a key to operate but will stand behind it with 100% money back guarantee if it does not work. This is certainly one of the nicest locks from this road that exists and is ready to display.